Fun, right? I decided to take a short cut and save some time, by using pre-colored digis. I've used, Happy Holidays Wreath, Santa's Jolly Smile, Moose Lights, and Fancy Little Stocking. I simply sized the images to fit into my tag die, printed them out and then die cut them. The camera does not show the sparkle on these! I've outlined with a glitter marker and also gave them a little once over with a glitter brush. I stamped the Merry Christmas greeting and added a reinforcement to the hole. I die cut those out of patterned paper. These little goodies worked up very quickly and they would be a good choice to mass produce. I die cut a plain white tag where I stamped the "to" and "from". 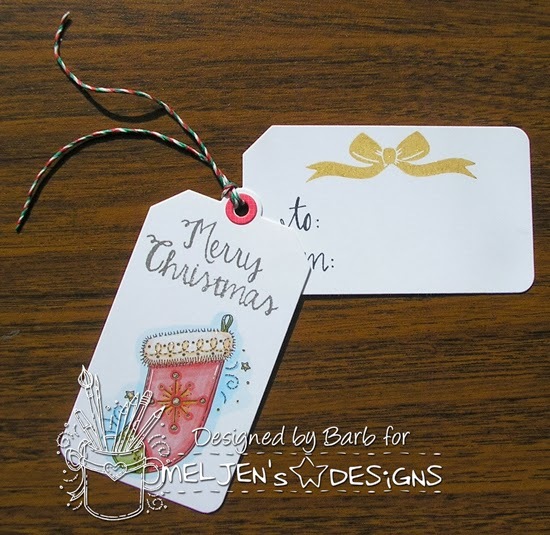 I also added that sweet bow, stamped in delicious Delicata Gold ink...LOVE that stuff! 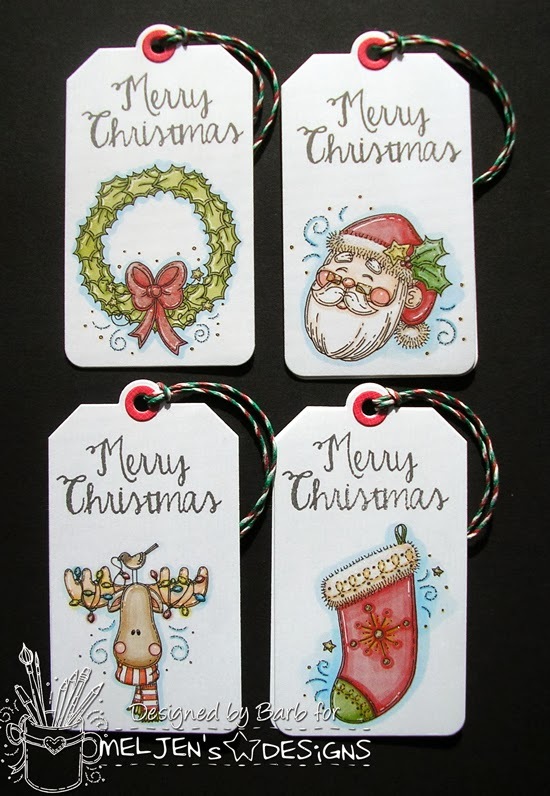 So these are some VERY sparkly gift tags! I tied both tags together using Lawn Fawn's Mistletoe Hemp Cord. This product is great. It looks like baker's twine, but it's a little heavier. It looks wonderful tied into a bow. And it holds it shape much better than regular twine. 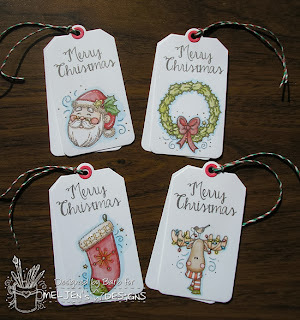 Now it's your turn...Create a Christmas tag and post it on our DT blog and you could win FREE digital stamps. Just remember to use a MelJen's Designs image on your tag in order to be included in the random drawing. 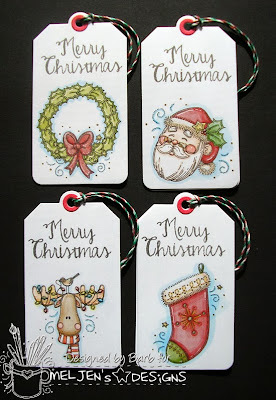 And please take a moment to stop by the blog to be inspired by the other DT members. Oh! MelJen's is having a Guest Design Team member call. Visit the blog to learn more about it. These are so darling Barb and I never would have guessed that they were pre-colored digis.